From 1950 to the mid-1970s Urmston Urban District Council (a sw suburb of Manchester) would stage the “Urmston Show” on Abbotsfield Park in Ursmton. 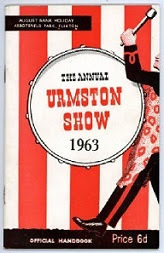 Following the 1962 Urmston Show the youth of Urmston spoke out saying that there was little of interest in the Show for them – they weren’t seriously interested in Mrs Smith’s Cake Stall! The local Council listened to them and took an unprecedented gamble to bring some of this new beat music to town. They booked Brian Poole & The Tremeloes to headline. 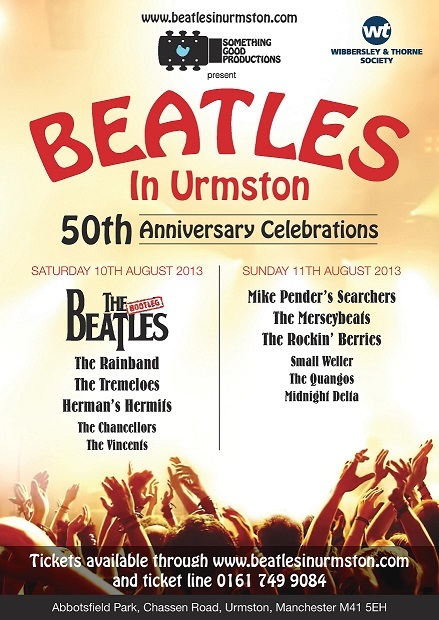 They also booked Merseybeat band “The Dennisons” plus local Manchester band Johnny Martin & The Tremors. They also booked The Beatles. At the time of booking the Fab Four were scarcely known outside of Liverpool, Manchester and of course The Reeperbahn in Hamburg. By the time their appearance on bank holiday Monday August 5th 1963 things had changed drastically. “Love Me Do”, “Please Please Me” and “From Me To You” had launched them globally, Beatlemania was peaking and they were just two weeks away from releasing “She Loves You”. It was two days after their 292nd and final appearance at The Cavern Club. Brian Epstein attempted to disassociate the band from the gig on safety grounds. Urmston Council however held them to contract and they duly appeared to scenes of glorious mayhem. The lads got ready in a shed on an allotment owned by Urmston Council Parks & Gardens Department and were then smuggled into venue in a Parks & Gardens Austin box van. 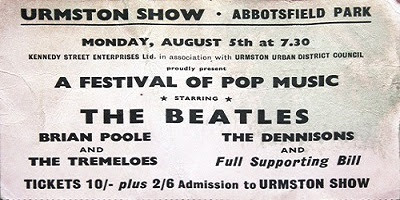 Needless to say The Beatles headlined to an audience of 1,000 inside a marquee on Abbotsfield Park. Atrocious weather reduced the anticipated park crowd from 12,000 to an estimated 4,000 people who descended on this small urban park to listen to and catch a glimpse of their heroes. After two years of planning, local resident Peter Killick backed by a small group of friends have now launched a weekend of celebrations based around two music concerts. On the evening of Sunday 11th August stars from the performing bands will be guest speakers at Davyhulme Golf Club, close by. Come and listen to people like Dave Munden (Tremeloes) talk about performing 50 years ago alongside The Beatles or the 1962 New Years Day audition with Decca when Decca chose The Tremeloes. Apart from the concerts we are showcasing local organisations – Flixton Academy of Performing Arts, Urmston Musical Theatre Group, 3rd Davyhulme Scout Band and Flixton Silver Band. 90 stalls of local arts, crafts and farmers market style will be on the park throughout the weekend – a very community spirited event.